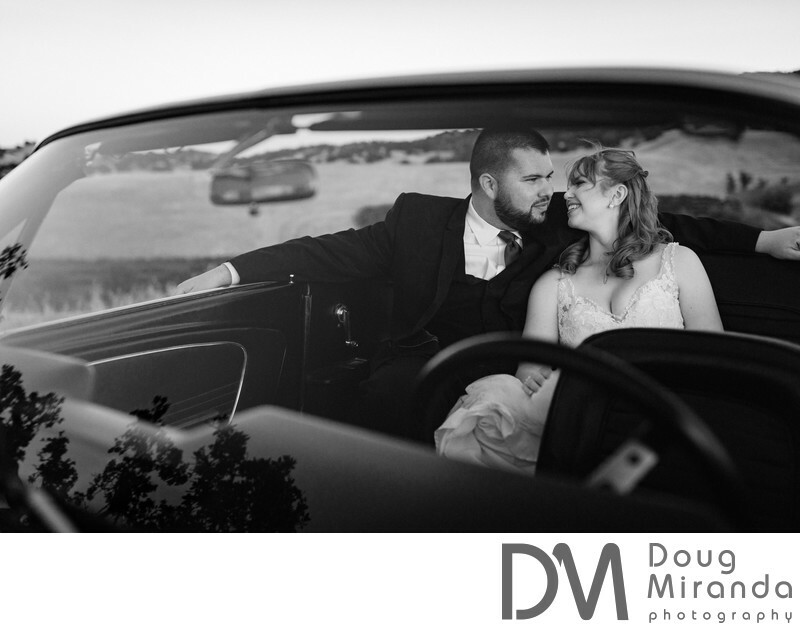 A bride and groom are sitting in a vintage Ford Mustang cuddling up together, while watching the sunset on a warm June day. Taber Ranch Vineyard & Event Center is located in the scenic Capay Valley in Northern California and was established back in 1867. This wedding venue is a true gem of the Capay Valley and the surrounding cities of Fairfield, Vacaville, Napa and the great Sacramento region. The wedding site is located in the rolling hills of the valley. On top of one of those hills sits the ceremony site with with 360 degree views of the whole region. At the base of the hill is a giant rustic barn which is used for the reception and dancing. Out on the neatly manicured lawn is were your guest will wine and dine with the bride and groom during dinner and speeches. Through out the 500 acre property are beautiful gardens, vineyards, giant oak trees and olive and almond orchards. With so much beauty in one place it’s tuff to pick locations for your wedding photos. On top of that the bride and groom are transported around the grounds in a red vintage convertible Cadillac or a red vintage Ford Mustang. Venue, Taber Ranch Vineyard & Event Center, 16628 CR 81, Capay, CA 95607. Flowers by Taber Ranch Vineyard & Event Center. DJ, Lighting & Photo Booth, Sky’s the Limit Entertainment, 928 Naify Ln, Santa Rosa, CA 95407. Location: 16628 CR 81, Capay, CA 95607.